Hybrids, electrics, clean diesels, biogas, hydrogen and biofuels. 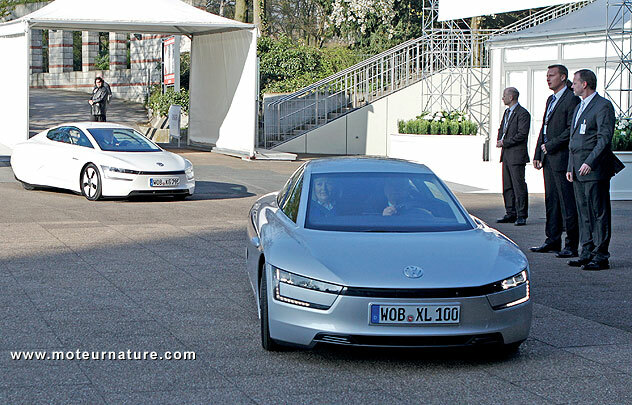 The Volkswagen XL1 plug-in hybrid gets driven. It’s real, or is it? This might be the most incredible car in the world. Its fuel consumption is one liter for 100 km as we say in Europe, which is equivalent to 235 mpg. A fantastic value because this is a real car, meeting all safety regulations the world over. It’s a 2-seater with crazy doors, but its best features are its exceptional aerodynamics (Cd could be below .20), a very light weight construction, and a superbly engineered plug-in hybrid drivetrain. Internal combustion engine is a 48-hp 2-cylinder .8-liter diesel with a 20-kW electric motor. Those numbers are far from impressive, but we have to keep in mind that the whole car may weigh less than 1,800 pounds. So it should be enough, if not exciting. 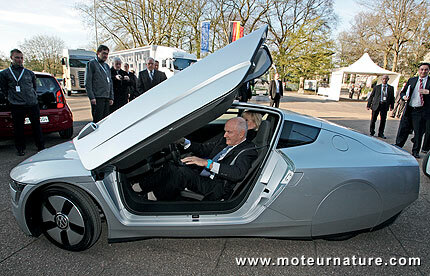 Ferdinand Piëch, chairman of the supervisory board of Volkswagen Group, drove one car with his wife, while Martin Winterkorn, the CEO of Volkswagen, drove another one. The funny thing is that they drove 2 cars, and that was more economical than driving all together in one single vehicle. The Volkswagen XL1 will be built in limited production next year. If its 235 mpg fuel economy is real, this is a game-changer. Can you imagine driving New York to Los Angeles with less than 15 gallons? If the Volkswagen XL1 gets real, the electric car is doomed! Motor Nature, green cars with joy of driving. Hybrids, electrics, hydrogen and biofuels from expert European eyes.